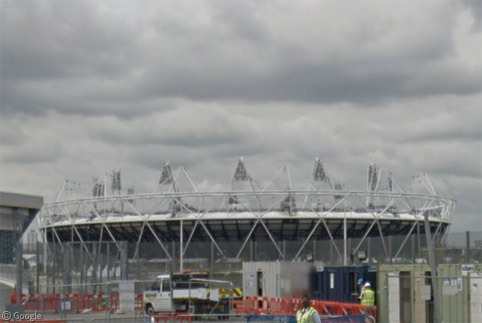 Continuing our tour of Olympic venues, we today move away from the Olympic Zone, to two other areas of London: the River Zone and Central Zone, where Games organisers are making use of well-known London landmarks for as many events as possible. 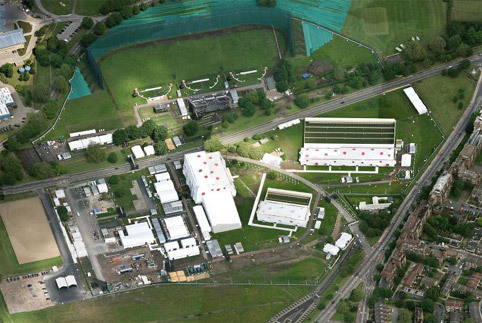 In the River Zone, the Royal Artillery Barracks will appropriately host all shooting competitions. The grounds have been segmented off into different ranges for rifle, pistol and shotgun events. My favourite feature here is the numerous buildings which have been designed to have the appearance of being riddled with bullet holes! Also in the River Zone are two arenas: the North Greenwich Arena1 in the Millennium Dome which houses the artistic gymnastics, basketball and Paralympic wheelchair basketball competitions and the ExCel Arena where a wide variety of different sports will take place. Greenwich Park is the oldest of London’s royal parks. It will host the equestrian events as well as some parts of the pentathlon. 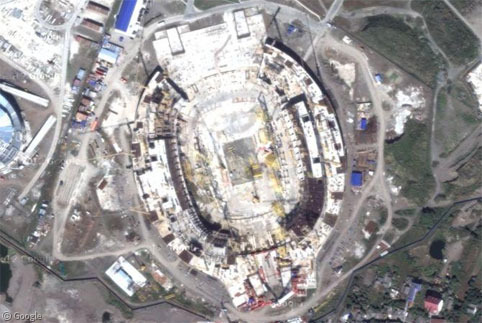 Bing shows the stadium partly constructed. The Central Zone encompasses all the other venues in the city – all for the Olympics as no Paralympic sports take place here. The marathon, triathlon and road cycling courses will take competitors past many of London’s most iconic tourist destinations, including Buckingham Palace, Hampton Court Palace, the Houses of Parliament and St Paul’s Cathedral. 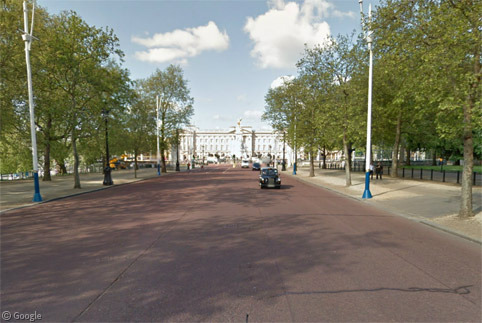 They also travel through two other royal parks – Regents Park and Hyde Park. It is these events where millions of spectators are expected to line the streets to see competition without having to purchase tickets. 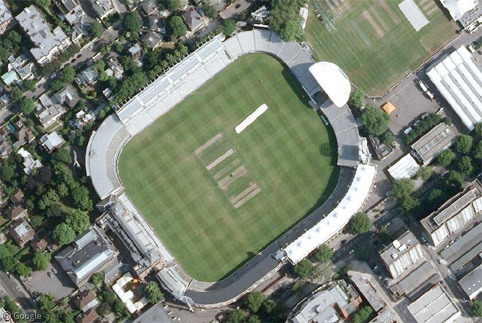 And at Lord’s Cricket ground, white-dressed cricketers will be displaced by archers wielding high-tech bows. The wide expanse of the pitch is needed for a competition held at distances up to 90m; ranges will be set up in front of the stadium’s grandstands. The Telegraph has images of training held this week. 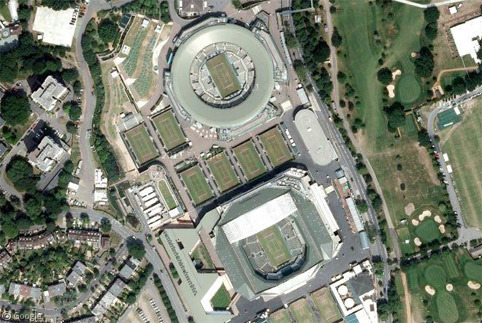 Here we see the All England Lawn Tennis and Croquet Club, more commonly known as Wimbledon. As far as I know, croquet is not an Olympic sport, so only the tennis courts will be used during the Games. Other Central Zone venues include Earls Court Exhibition Centre (indoor volleyball), Wembley Arena (badminton and rhythmic gymnastics) and Wembley Stadium, where the football final will be held. 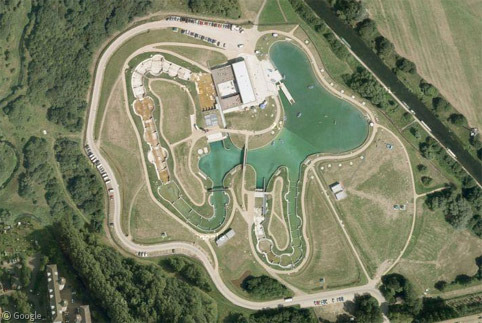 When we previewed some of these venues a few months ago, the Lee Valley White Water Centre in Hertfordshire (north of London) was mostly dirt and concrete. 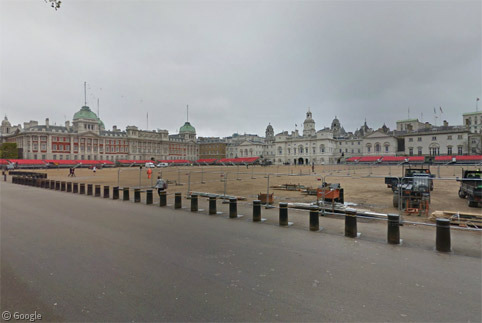 Here it is in its completed state, though with no white water apparent on the updated Google imagery. Canoe and kayak events will take place here, with temporary seating in place for 12,000 spectators. The main loop on the west-side of the site is the competition course, while the smaller loop to the south is for practice and warm-ups. Huge pumps can create a water flow up to 13 cubic metres per second. 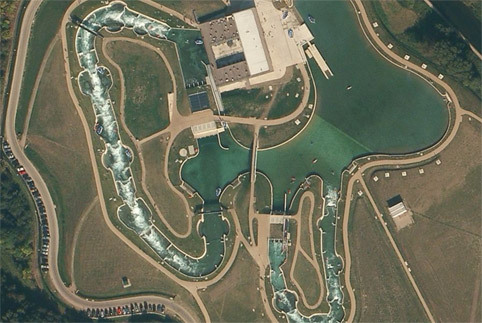 The Olympic torch was even taken on a white-water raft ride here, as part of its months-long journey around the UK. However, this video shows that fire and water don’t mix, with the torch having to be relit from a backup flame at the end of the run! Bing allows us to see the white water in action, with several rafts and kayaks visible. 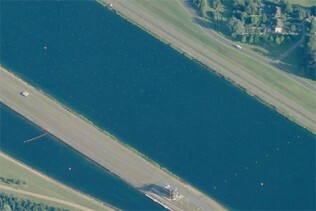 Flatwater canoe and kayak races will be held west of the city, at Dorney Lake in Buckinghamshire. More temporary seating will be needed here – for up to 20,000 viewers, many of whom will park at Windsor racecourse and take a temporary bridge across the River Thames to reach the venue. Google allows us to see the entire 2.2km (1.4mile) course, while Bing has Bird’s Eye coverage of part of it, with the lane markers visible. The road cycling course takes riders out of the city towards the south-west before returning for a grand finish on The Mall near Buckingham Palace, where home fans will be hoping for Mark Cavendish to take the gold medal. 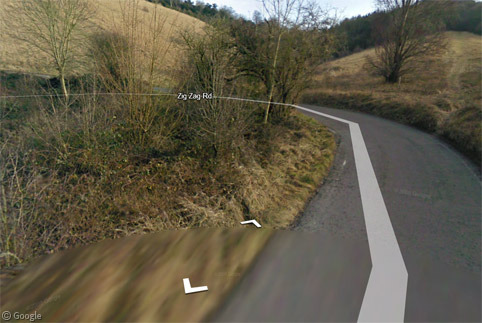 However, he may struggle with the 9 laps which take in the Zig Zag Road on Box Hill, a narrow and steep 2.8km (1.7miles) climb with several hair-pin bends. 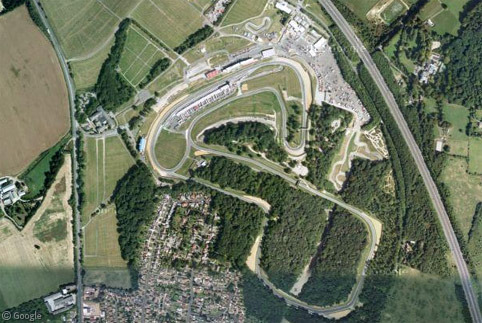 Paralympic road cyclists will race at Brands Hatch – both on the circuit which is normally used for motor car and bike races, and on surrounding roads to the south-east of London. 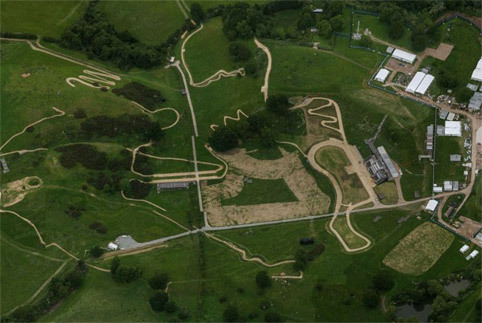 Mountain bike races will be held in Essex, at Hadleigh Farm near Southend-on-Sea. The 5km (3mile) course is mostly across open hills, which is unusual for a sport generally held in forests or woodland. Thousands of tonnes of rock and crushed stone were used to construct a challenging course. 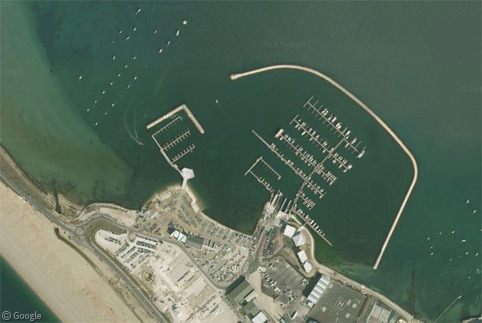 All sailing events will take place on England’s south coast, at the Weymouth and Portland National Sailing Academy in Dorset. A new marina, slipway and moorings were constructed to accommodate all the boats needed for competition. Finally, five stadiums around the UK will be used for the football competition, geographically spread across different regions to try to reach as many people as possible, including the national stadiums in Scotland and Wales. 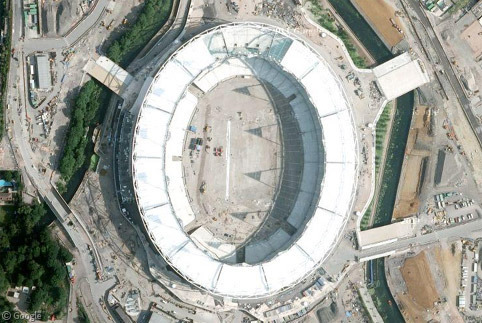 These stadiums are: the City of Coventry Stadium, Old Trafford (home of Manchester United), St James’ Park in Newcastle upon Tyne, Millennium Stadium in Cardiff, Wales and Hampden Park in Glasgow, Scotland. 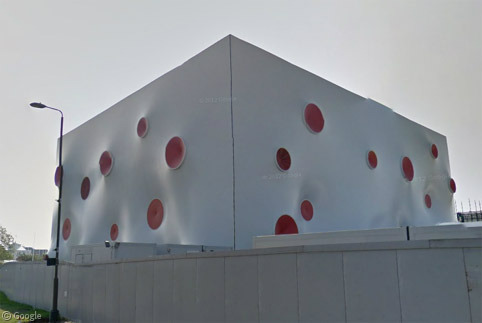 Wikipedia and the London 2012 site both have much more information about all of the venues. 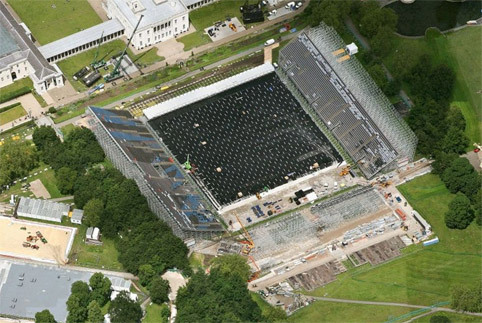 It’s a disgrace what they have been allowed to do to Greenwich Park. It’s a totally inappropriate place to hold the equestrian events, even high profile people in that sport say so. PS I have nothing to do with the above site, I’m just someone who liked Greenwich Park the way it was. You clearly have no clue about the issues at stake. No-one’s saying the games shouldn’t be staged. They should have constructed state-of-the-art facilities that would have provided a great legacy for people involved in equestrian sports. When visitors come to attend the Olympics, they should also be able to enjoy the host city’s attractions. Unfortunately, if they want to visit the Greenwich Meridian, the place that forms the basis of the world’s system of time zones and that enabled the development of modern navigation, ultimately heralding world trade and globalisation – they can’t because it’s closed. In the UK, it seems we cover our World Heritage Sites in portacabins and cables. Perhaps they should have converted the Great Wall of China to stage the marathon in 2008, or flattened the Forbidden City in order to accommodate a car park. But then again, why would you bother to research anything or articulate an argument when you have learned all you need to know about history or culture from children’s TV? And even then, you have misunderstood what the Luddites actually represented. I was merely using a fun way of pointing out that I didn’t think this was the right forum for a political rant. I do have an (educated) opinion on the matter and it differs from yours. But, because of my above point, I will not engage in that discussion here. And I DO hope you can still enjoy the Olympics … I certainly intend to. Not a political rant at all, he’s been mild by comparison with what I’d have said. Let’s take the legacy as a fer-instance, the entire Stratford site is now closed for two whole years while they remove the temporary stadia, which were utterly unnecessary given the large numbers of semi-derelict stadia nearby which could so easily have been renovated, from Walthamstow to Leyton and West Ham. By the time that’s done, any enthusiasm the locals might have had will be long past.